Young budding entrepreneurs demonstrated their business acumen when they visited Middlesex University for a junior enterprise competition, part of a scheme to inspire and encourage local schools pupils into business. The competition, run during Global Entrepreneurship Week, aimed to discover the best young entrepreneurs from around North London. 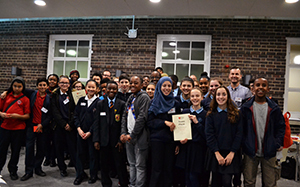 Teams of Year 8 pupils from six different schools including Acland Burghley School, Cumberland School and St Thomas More Catholic School were assigned the task of coming up with a new concept and business plan for a student social activity centre on campus. In their bid to win the competition the teams undertook market research, consulted with business gurus, designed their proposals and presented their business plans, which were judged by leading business professionals and academics. 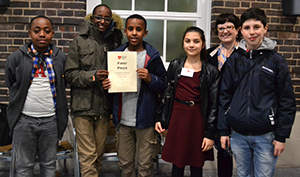 The team from Acland Burghley School were crowned the Junior Entrepreneurs of the Year while teams from Park View School and Highbury Fields School won the second and the third place respectively. Contestants Thelma and Ella from Highbury Fields School said: "We all had a really great time. It was amazing to see what university feels like and we definitely learnt a lot about improvisation, teamwork, time management and communication. "We really like the fact that we could talk to successful business professionals; this really helped us develop our ideas. We also enjoyed showing our creativity by making posters. Although difficult, the challenges set strongly represented what happens in real life. This showed us why being able to improvise is so important in business. " Under the watchful eye of Dr Simon Best, who runs Middlesex University's Enterprise Development Hub, all the participating pupils were shown the basics of running a business including how a business operates, business plans, promotion and advertising, and finance throughout the interactive task. Middlesex 'business gurus' were on hand to offer advice and guidance to the pupils as they completed the task. Park View School teacher Chris commented: "The day was a really engaging experience for the students, which is always helped by the element of competition against other schools. I thought the setting of the challenge was great as it allowed our students to be amongst university students and not shut away in a room. The organisation was excellent, both students and staff were well looked after and I'd recommend it to colleagues."